*Disclaimer: These products were supplied to me at no cost to review. This does not sway my opinion is any way and this is a review I would have given even if I paid for them. I first used an Aveeno product back in high school when I was suffering from super dry skin. It was a body moisturizer with oatmeal and I had seen it advertised on the pages of my Sassy, Teen and Seventeen magazines. It is funny how times have changed and how we learn about things now through such wide variety of media streams! Anyhow, the oatmeal lotion was superb to heal my dry and flaky skin and I even used it on my face. I have always associated Aveeno with oatmeal. But here in modern day, I realize that it is about so much more than just oatmeal. They have a whole range of skin care for face and body, and they even have a super hot spokeswoman – the lovely Jennifer Aniston. 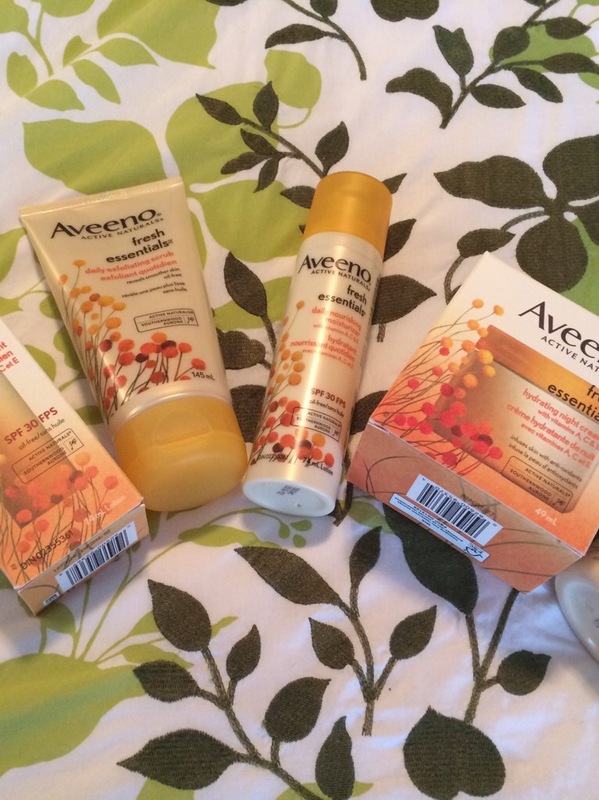 I will admit that it has been many years since I tried any Aveeno products, so when these items arrived on my doorstep I was eager to check them out and experience them on my skin. The products that came are part of a line called Fresh Essentials® and they are touted to “replenish moisture to stressed skin and reveal natural beauty with ACTIVE NATURALS® ingredient, Southernwood Extract and vitamins A, C, &E.” The idea of this line is to keep what’s good for your skin IN- and the bad OUT. Now I have been working in the business a very long time, and the vitamin A, C, & E is a commonly used antioxidant cocktail that you will find in may skin care products. SCIENCE LESSON: An antioxidant helps to block the effects of free radicals in your skin. Free radicals are are atoms or groups of atoms with an odd (unpaired) number of electrons. These can be formed naturally, but things like excess sun exposure can cause a free radical. Once formed these highly reactive radicals can start a chain reaction, like dominoes. They can really weak havoc and react with important cellular components such as DNA, or the cell membrane. Cells may function poorly or even die if this occurs. To prevent free radical damage the body has a defense system of antioxidants. The addition of Southernwood Extract in this formula is said to also provide antioxidant protection and help to strengthen your skin’s natural moisture barrier. This in turn will help your skin keep the vital elements like water in your skin and guard against the bad stuff from getting in (hence moisture barrier). 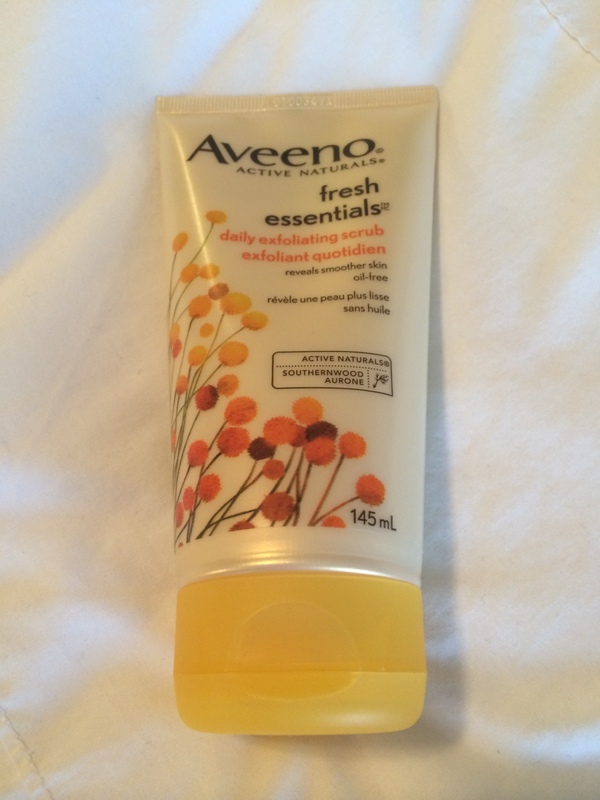 The very first product that I tried was the Aveeno Fresh Essentials® Daily Exfoliating Scrub. I tried this in the morning while I showered, and I enjoyed the gentle exfoliation. It was not aggressive by any means, but it felt like something was actually in there. It did not foam a ton, which I really like because I find things that foam a lot are really drying. It rinsed away clean and did not leave a residue. I can’t say there was any significant scent in this scrub, but it had a mild and pleasant smell. This product comes in a 145 mL tube and retails between $9.97- $12.99 CAD. I will give my honest opinion here that I think this is a steal for the price. 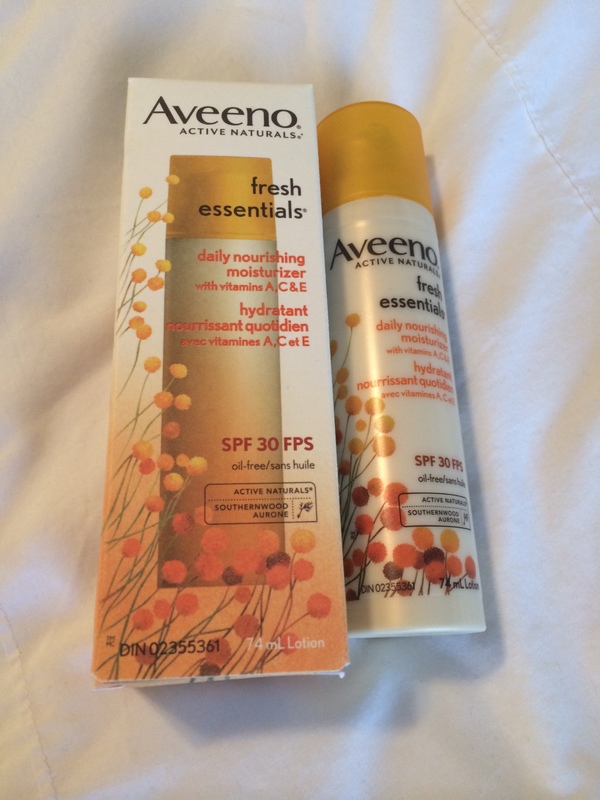 Next, I tried the Aveeno Fresh Essentials® Nourishing Moisturizer SPF 30. Sometimes moisturizers that have an SPF over 15 in them can be quite heavy and difficult to rub in. This was not like that at all. The moisturizer was delivered via pump, and one pump was more than enough for my face. It absorbed quickly and left my face feeling comfortable and moisturized, but the most amazing part is that I was able to apply a powder foundation over top of it about 15 minutes later without any streaking or patchiness. The lotion that I was using before I tried this never seemed to absorb and made my powder go on weird. I like this moisturizer a lot, and considering I usually spend around $40 for 50 mL, this Aveeno Fresh Essentials® Nourishing Moisturizer SPF 30 is HUGE at 74 mL and costs a mere $16.97- $19.99 CAD. 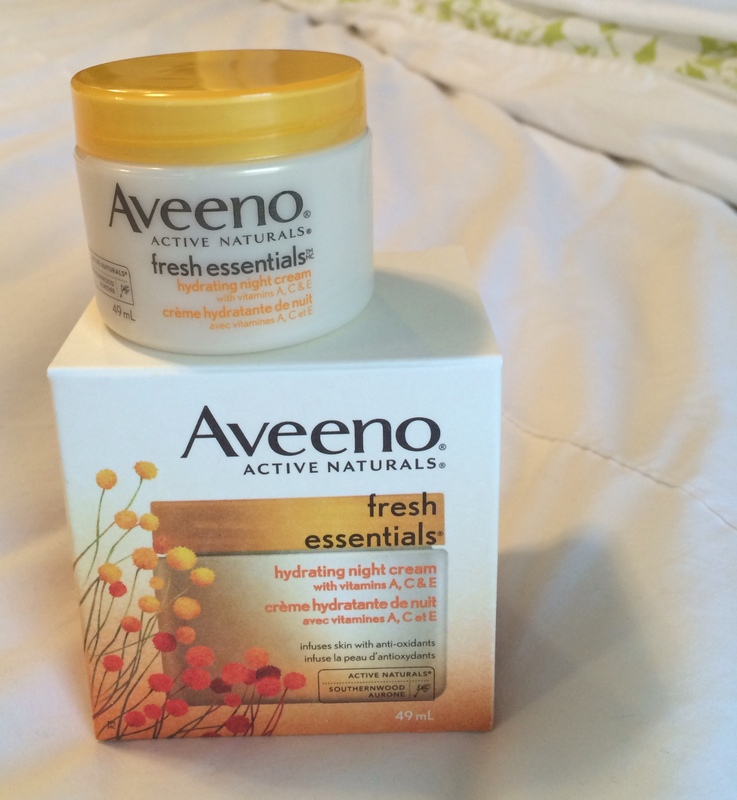 Then, in the evening I tried the Aveeno Fresh Essentials® Hydrating Night Cream. This cream felt very nice going on my skin, and it was also quickly absorbed. I like that I didn’t feel it on my skin since quite often I find night creams to sit on top and rub off all over my pillow or make my hair stick to my face. This one was another winner from Aveeno, and in the morning I was definitely well hydrated still. This night cream retails for $16.97- $19.99 CAD for a standard size jar of 49 mL. What I liked: You can get started on a simple skin care regime for less than $60. It felt wonderful and proved to be very effective for me as I tested this in a cold snap during winter time. Overall the line is attractive and functional. What I would change or improve: I would like the night cream in a squeeze tube as I don’t like dipping my fingers into the jar. I would always enjoy packaging that looks more premium, but realize that would increase the price too. I honestly had to really stretch my mind to find things I would improve about this product. Who I would recommend this to: Normal or normal to combination skin. People of any age looking for hydration and/ or sun protection built in to their daily moisturizer. It should also be noted that these Aveeno Fresh Essentials® products are all oil- free, hypoallergenic (does not use any known allergens) and non- comedogenic (does not clog pores). So this is my first official product review of something that I was provided at no charge to try for the purpose of this blog. I am please to have been able to review something that I actually like and can see myself using again. I wrestled with the idea of taking products from brands/ PR firms to try for the purpose of reviews because I really want to keep this blog honest, so I have decided that if I accept something to try I am NOT obligated to review it or give a BS positive review. If I like it, I will tell you. If I don’t like it I probably won’t even mention it at all. Deal? Now it is your turn to tell me something Foxes – have you ever used an Aveeno product? Are you using any now? I would love to know! Categories: face, product reviews, skin | Tags: Aveeno, beauty, cleanser, Fresh Essentials, moisturizer, night cream, product review, skin, skin care, SPF 30 | Permalink. Ahhh- there is nothing like a nice mask and a glass of wine… I know Leah didn’t mention wine, but what else are you going to do for those 20 minutes? 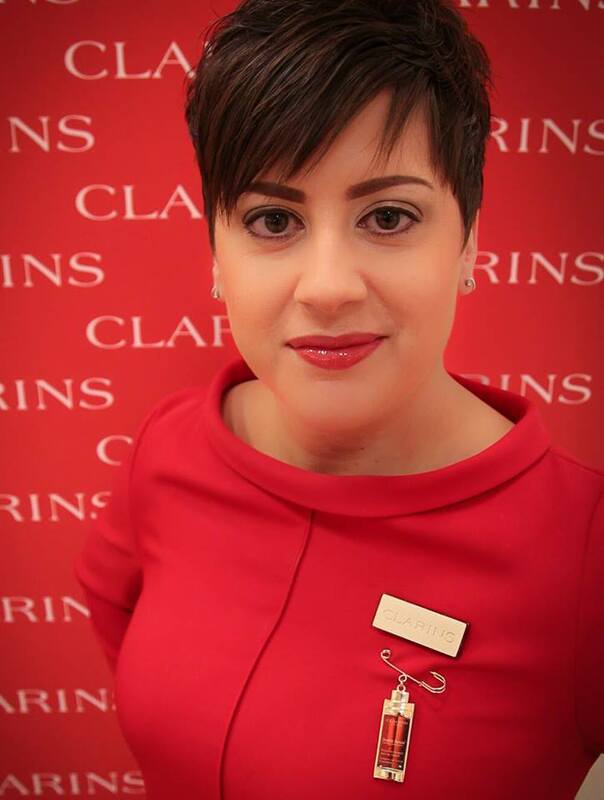 Categories: advent calendar, beauty tips, face, skin | Tags: advent calendar, beauty, beauty tips, Clarins, dehydrated skin, mask, skin care | Permalink. As I begin work in this post, many of my friends live in an area with minus 40 weather happening. This one’s for you Foxes! The face. Finally, we are going to talk about cold weather and that Foxy Face of yours. When it’s cold outside, we cover up a good portion of our bodies, but our face almost always braves the elements. The cold can make it rough, dry, flaky and you can even get a wind burn and sun burn! If you live somewhere that gets cold in the winter, you need to make a few alterations to your skin care routine. Let’s start with the basic act of washing your face. This may be something you do in the shower or at the end of the day to remove makeup, or both. Using something too soapy or aggressive can strip your skin of moisture even more, so you need to use something gentle. Look for a mild cleanser for your skin type. Cleansers that have a milky or creamy texture generally tend to be a little milder. Always buy for your skin type, or something suitable for all skin types. Usually an “all skin type” product is good for normal or combination skin, but if you are extremely oily or extremely dry, get something for your specific type. Vichy makes some a good range of cleansers in their Pureté Thermale line. Also check out Avène and La Roche Posay for gentle yet effective cleansers. If you use a toner, consider using a mild one. Toners do not have to sting or feel tingly, in fact they can even moisturize skin. Whatever your skin type, ensure to get the right toner for your skin type. As mentioned above, Vichy, LaRoche Posay and Avène offer great options. Moisturizer is really where you will get a good bang for your buck. If you use something specific in the summer months, see if the line offers one a little heavier in the same line up but still for your skin type. Often the heavier ones just offer a little more consistency for comfort. Lots of lines offer a moisturizing serum which you can layer in below your regular moisturizer for an extra kick. For example, I really like Biotherm Aqausource for normal/ combination skin, and when it gets really cold I use the Aquasource Deep Serum along with the moisturizer. This is an easy way to winterize your skin care routine. You do not have to stick within the same brand if you add a moisture serum, and almost all skin care brands make them. Elizabeth Arden 8 Hour Skin Cream Protectant – Protect skin from drying wind, central heating and air conditioning. This skincare multi-tasker soothes, restores, calms and helps relieve minor skin irritations, including roughness, redness, chapped, cracked or dry skin. I recommend using this to treat, but also to protect skin if you know you are going to be exposed to extreme weather conditions. La Roche Posay Cicaplast Baume B5 – For very dry and irritated skin for adults, children and babies (chapping, dry patches, diaper rash, etc.). I have used this on my own babies for chapped winter faces and it helps heal and protect. Avène Skin Recovery Cream – Calms irritation and restores the skin while helping to reduce the skin’s reactivity. Also provide long-lasting protection. Foxes, I hope this post gives you some ideas to help keep those faces looking gorgeous throughout the colder months. Tell me, what specific face care product(s) do you use in the winter? How do you change up your skin care routine? Categories: face, skin | Tags: beauty, moisturizer, skin, skin care, winter | Permalink. Well the cold dry weather is not letting up anytime soon where I live, and each and every part of my body is screaming for hydration! I have covered lips and hands tips in the past two entries of this series- and now it’s time to talk about the largest area that requires TLC. The skin on our body tends to get pretty crocodile – like at times, and winter requires that you give it more attention than usual. Let’s start with your shower or bath time. When it’s cold outside your instincts may want you to have a good hot soak to warm up, but try to keep your bathing and shower water temperature tepid. This means lukewarm. I agree Foxes, this isn’t ideal for me either when I’m freezing, but if you use too hot of water it will strip your skin of moisture (or what’s left of it) and it will be left feeling parched, possibly even scaly. Also, limit you your soak to no more than 15 minutes. Now, what you use to cleanse can really make a difference to your skin health. Try to use something that mentions that it is moisturizing. I discovered Avene Xeracalm A.D Lipid – Replenishing Cleansing Oil this year. It is created for a very dry/ itchy skin, and cushions the skin while strengthening the natural barrier of your skin. This is a soap free and fragrance free formulation, so it lathers only a little but feels creamy and soothing. Speaking of lather, you don’t need much of it. In fact, the more bubbles or lather, the more drying the soap or cleanser can often be as it strips your skin of precious oils. If you like a bar soap, often glycerine based ones are more gentle and less drying. A step that many of us are missing in our body care routine is exfoliating. Now, if you read my hand care blog you’ll already know this, but exfoliating is a big help to getting your supple skin to return. If your skin is dry and scaly, you end up wasting a lot of cream or lotion. It just ends up sitting on top if the flakes and scales rather than absorbing and doing the job it is supposed to. Think of exfoliating as an enabler- it lets your cream or lotion gain access! Ok, so I am a huge fan of body exfoliators, particularly a sugar based scrub. I love Soap & Glory Sugar Crush Body Scrub. It has enough of a scrub to really get rid of the flakes, and a refreshing smell too! When I use a scrub in the shower I like to get soaked, then turn off the water and apply my scrub. This allows me to get it all over and really give myself a good scrub before it all rinses down the drain. Note: skip exfoliating anywhere you are shaving as it will be too much action! Once you step out of the shower or bath, gently blot off with a towel. Don’t rub your skin vigorously to dry off because you want to leave little bit of the water on your skin. Apply your cream or lotion right away to help to seal in some of that dampness left behind, and also this will give it time to absorb before getting dressed. I found Avene Xeracalm A.D Lipid – Replenishing Balm great for the winter months, and even use it on my children as it is so gentle and healing. I also really love Biotherm Baume Corps Body Balm Oil Therapy Nutri-Replenishing Body Treatment. This has a delicate apricot scent and a very pleasurable texture that leaves your skin feeling wonderful and luxurious. Those simple steps will help you get your skin back in shape in no time! Just because it’s the season of being covered up it doesn’t mean we should make our skin suffer. Time to hear from you now Foxes – what is your go-to body care for the winter months? Do you have a preferred lotion, cream or other body product that is a must-have for the colder season(s)? Categories: body, body | Tags: Avene, beauty, beauty tips, Biotherm, body care, skin care, Soap & Glory, winter | Permalink.